Feed Mycotoxin Binders Market size was over USD 90 million in 2016 and consumption should exceed 190 kilo tons by 2024. Growing demand for protein rich meat source like poultry, swine and ruminants along with rising animal health awareness should have positive demand outlook for feed mycotoxin binders market size. These products prevent contamination in animal diet, other feed additives including amino acids, antioxidants, vitamins and trace minerals also reduce toxic effects observed in animals. Rising incidences of mycotoxin (secondary metabolites) traces found in animal diet drives demand for natural and economical detoxification procedures. Some practical applications to reduce contamination in livestock food include physical treatments like washing, polishing, segregation, flotation, separation, roasting, solvent extraction and microwave heating. The efficiency of these methods depends upon level of contamination and requires alternative additives which can propel feed mycotoxin binders market size. Global animal feed additives market size is expected to surpass USD 22 billion by 2024. Regulated use of antibiotics growth regulators (AGPs) and growing consumer health awareness should drive animal feed additives demand. Improved consumer living standards along with shifting consumption trends toward protein rich diet leads to increasing meat & poultry product demand and should propagate feed mycotoxin binders market size. Stringent regulations set forth by health & safety agencies towards standardizing meat products to protect consumer from disease outbreaks such as swine & bird flu should drive feed mycotoxin binders market size. Recent push towards clean label technology and preference of natural based products over synthetic along with increasing application of microorganisms capable of bio transforming secondary metabolites into less toxic substance which should further bolster product demand. Bentonite mycotoxin binders market size should witness strong gains at over 8% during forecast timeframe. This growth in demand can be attributed to improved pellet quality, flowability, feed efficiency, rate of gain and production. High adsorption capacity, irreversibility, specificity and safety provided upon consumption of these products should have positive industry outlook. Polysaccharide mycotoxin binders market size will emit significant growth surpassing USD 20 million by 2024 owing to strong application scope in animal feed industry. They offer to bind a broad range of secondary metabolite in livestock diet through wide span of gut pH ranges and reduce bioavailability of these products in animals improving health and productivity. 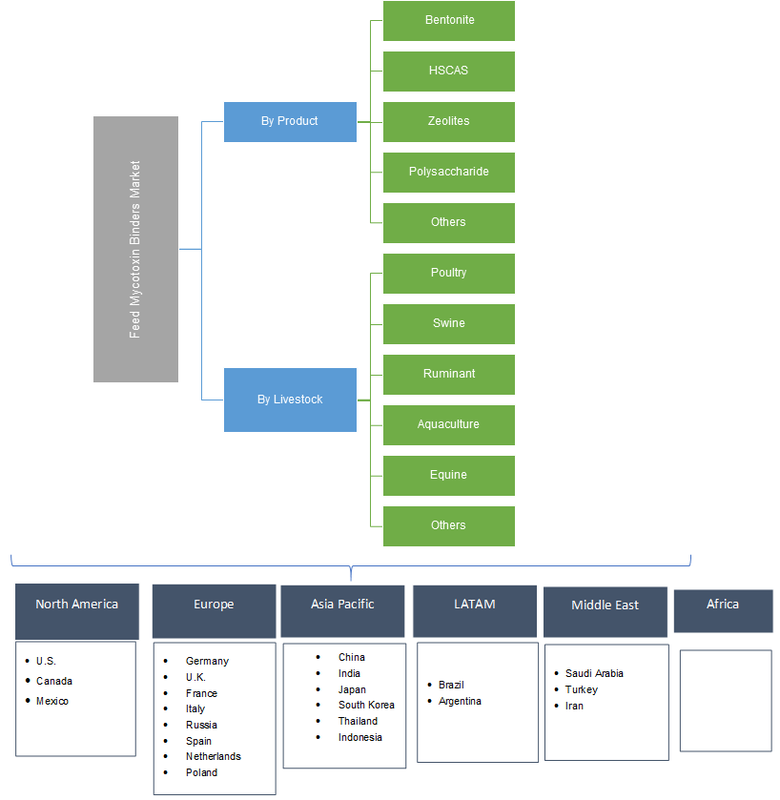 Hydrated sodium calcium aluminosilicate (HSCAS) mycotoxin binders market size will show strong growth during forecast period. A large amount of contaminants which include fumonisins and zearalenone can be bound & managed effectively to improve livestock performance, productivity and mortality. They also contain specific mineral substances like calcium, sodium and aluminum thus driving product demand. Feed mycotoxin binders market size from poultry applications should witness significant gains at and cross USD 85 million during projected timeframe. This demand can be attributed to increasing meat consumption rates and drive for healthy and safe feed. Poultry industry is highly susceptible to disease like bird flu which is majorly caused by toxic food substances, providing opportunities for industry growth. Aquaculture applications should grow at rates of over 9% by 2024. Aquafeed when meets water cause formation of secondary metabolites harming aquatic life. It demands binding of potentially detrimental contamination present in aquafeed and should propel product demand. Europe feed mycotoxin binders market size led by Germany, France and Italy will grow substantially surpassing USD 55 million by 2024. Strong poultry and meat demands from growing food & beverage industry like fast food joints, restaurants and processed food segments should strengthen regional industry growth. China feed mycotoxin binders market size should witness gains at over 9.5% during projected period owing to considerable increase in traces of secondary metabolites in livestock food. Rising disposable income along with consumer preference towards healthy food habits should bolster demand. High population growth rates cause increasing food demand which should thereby strengthen regional industry growth. 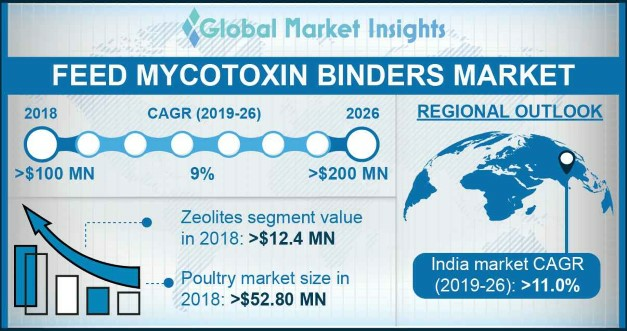 France feed mycotoxin binders market size will grow steadily during forecast timeframe due to stringent regulations and policies adopted by health & safety agencies in Europe towards standardizing poultry, swine and ruminant meat products. Growing consumer awareness for diseases like bird and swine flu should further bolster regional product demand. Global feed mycotoxin binders market share is moderately concentrated with industry players including VisscherHolland, Alltech, Kemin, Bentoli, Biomin and Selko. These industry players focus on strengthening their production capacity along with expanding its distribution network and regional presence. Nutriad International has developed & introduced MYCOMAN, a secondary metabolite management mobile application. Participants also concentrate in expanding their product portfolio through mergers, acquisition and partnerships. Livestock enterprises lose huge sum of money caused by contamination of animal feed ingredients and compound feeds by toxic metabolite moulds known as secondary metabolites. Commonly found secondary metabolites include are fumonisin, monoliformin, deoxynivalenol and zearalenone. Consumption of these harmful toxic strains may cause disease and even mortality. These binders coagulate and bind these secondary metabolites reducing its noxious effect on feed ingredients.